Access to the internet is considered so vital that in 2016 the United Nations passed a nonbinding resolution to make disruption of internet access a violation of human rights. And while governments and private companies are working to increase access to the internet the world over, many in emerging and developing countries remain non-internet users. Across the 39 countries, a median of 75% say they either use the internet occasionally or own a smartphone, our definition of internet use. In many advanced economies, nine-in-ten or more use the internet, led by South Korea (96%). 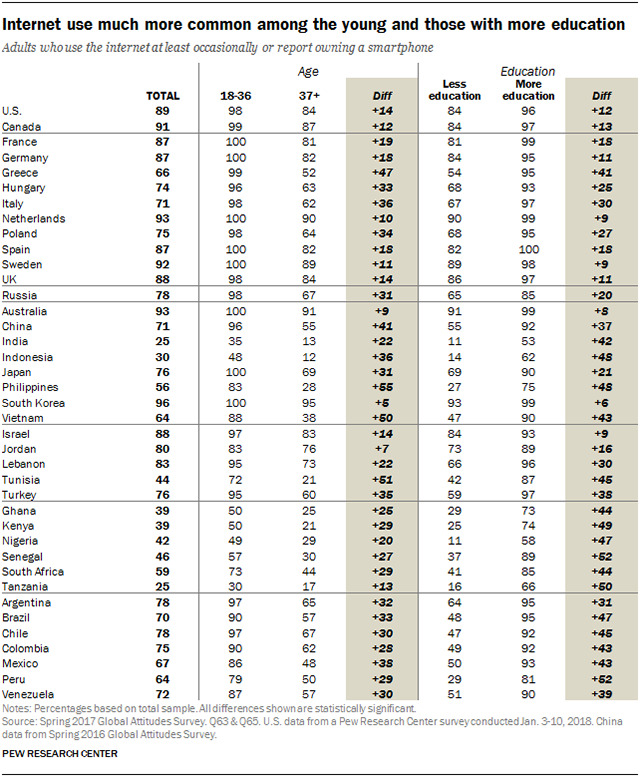 Greece (66%) is the only advanced economy surveyed where fewer than seven-in-ten report using the internet. Conversely, internet use is below seven-in-ten in 13 of the 22 emerging and developing economies surveyed. Among these countries, it is lowest in India and Tanzania, at a quarter of the adult population. Regionally, internet use is lowest in sub-Saharan Africa, where a median of 41% across six countries use the internet. South Africa (59%) is the only country in the region where at least half the population is online. Although they still lag behind most advanced economies in internet use, emerging and developing economies have seen greater gains in recent years. There has been a significant increase in internet use in 11 of the 19 emerging or developing economies surveyed since 2015. The most substantial increases in internet use since 2015 were in South Africa and Lebanon, which each experienced a 17-percentage-point increase. The Philippines and Senegal also saw large increases in internet penetration since 2015. Across the countries surveyed, young people (18 to 36 years old as of 2017) are more likely than older generations to use the internet. Those with more education are also more likely to use the internet than less-educated adults. In three countries, there is at least 50-percentage-point gap between younger and older generations: the Philippines (55-percentage-point gap), Tunisia (51 points) and Vietnam (50 points). Among advanced economies, the largest generational divides in internet use are found in Greece (47-point gap), Italy (36 points), Poland (34 points) and Hungary (33 points). Education is also a dividing factor on internet use, with significant gaps between those with more and less education in all countries surveyed. In all but five, these differences are in the double digits. While age and education gaps on internet use were found in all countries surveyed, gender gaps are far less pervasive. There are significant differences between men’s and women’s use of the internet in just 12 of the countries surveyed. And in only one of these 12 countries – Lebanon – are women more likely than men to use the internet (87% and 79%, respectively). The gender gap is most apparent in Africa, with men more likely than women to use the internet in Tunisia, Ghana, Kenya, Nigeria, Tanzania and Senegal. There are also double-digit gender gaps on internet use in India and Japan.